Overdrive: Le Jog heads into Action! We're really sorry about the delay in getting this release out. This is due to problems in downloading releases from our usual news wires. Here it is now, a little late... but Hopefully still time for you to get out and see the event in it's second and third days. Someone tell us what it is, because that, is BEAUTIFUL! 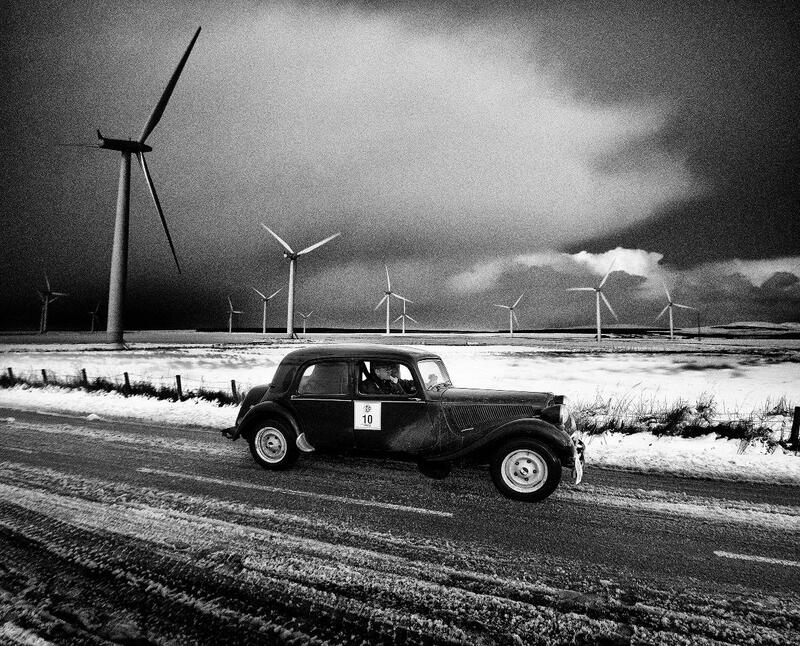 The rally gets under way on Saturday and will see the cars ranging from a 1937 Riley Sport to a 1958 Jaguar XK 150 battling it out to win the prestigious event. 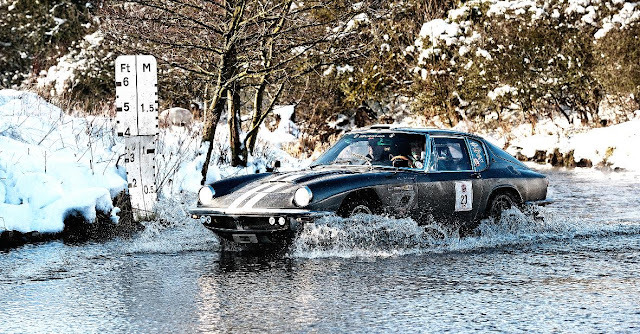 It will be the 17th annual running of the world acclaimed rally which takes place between December 10th and 13th will see the cars competing over a a 1,400 mile course between Lands End and John O'Groats with the longest night navigation section ever to be included. Seventy cars will leave Lands End on Saturday at 07.45 on a route across Britain that will see them travelling through Cornwall, Devon, Somerset, Wales, Shropshire, Cheshire, Lancashire, North Yorkshire, Northumbria, Northumberland, East Lothian, West Lothian, North Lanarkshire, and across Scotland to John O’Groats over a four day period. Hero’s Event Director and Clerk of the Course for Le Jog, Peter Nedin, said: “Le Jog is one of the toughest events of its kind in Europe, possibly the world, and we constantly strive to maintain this enviable reputation. We have no idea what the weather will bring but it certainly won’t stop the drivers of these cars who will do all they can to finish to course no matter what the conditions. All sorts of cars will be taking part including a Riley Sports Special from 1937 driven by Richard Jeffcoate and James May from Surrey. A 1958 Jaguar XK 150 being driven by Charles Graves and Ron Palmer from Surrey and a 1960 Peugeot being driven by Pieter and Thijs Hennipman from Holland. Other cars include BMW’s, Triumphs and Porsche. Spectators are encouraged to turn out and see the cars go through their area. BMW Park Lane Classic, who as part of a sponsorship deal with HERO has prepared a 1973 BMW 1602 saloon for the event. The car, which will also be included in HERO’s successful Arrive & Drive program, has been repatriated from ITALY. AVIS will also be supporting the event by providing all coordinating and support vehicles, which will be used by the organizers and marshals to steer crews safely to the finish. The infamous Welsh night section will have over 30 time controls - 75% of which will be 4 minute sections and the longest section will only be 3.5 miles - but the route has been designed with loops to allow controls to be cut for those running late. In addition this year's Le Jog will have some 30 tests at 26 venues - more than double the number of some recent Le Jogs Many of these tests will be at exciting new venues while those at ones previously used have been completely redesigned. The overall number of regularities has been reduced slightly but the Jogularity format will be exploited to the full and Le Jog will continue to provide the navigators with considerable map-reading challenges. There are crews from the UK, Europe and America driving, between them 7 Mercs, 7 Triumphs, 6 Minis, 5 MGs, 4 BMWs; 4 Porsches; 3 Volvos; 3 VW's and many more.